Slow roasting meat on the grill over a wood burning fire is one of the best ways to cook fresh beef, chicken, or fish. Grilling not only imparts a delectable depth of flavor to food, but also provides for an enjoyable and fun cooking experience. In Latin America it’s a popular way of cooking among average folks as well as upscale restaurants and is known as asado. Argentinians, in particular, are known for their expertise in grilling. Luckily it’s not necessary to travel to enjoy tasty treats fresh from an asado grill. You can make your own grill at home. 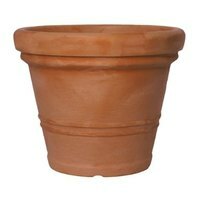 Purchase a large v-shaped terra cotta clay plant pot from your local nursery supply store and three clay feet for the pot to sit on, which keep it off the ground by a few inches for sake of ventilation. Be sure to select a double rimmed pot made of Italian terra cotta to ensure a long lasting quality grill that does not crack with frequent use. Purchase two circular metal grills designed for BBQ use. One larger grill will serve as the actual cooking surface and a smaller grill will be used as a surface to hold the charcoal below. Align the clay pot feet evenly spaced in a triangle shape just wide enough so that the base of the plant pot can rest on the feet. Place the pot on top of the three feet. The pot feet are used to keep the plant pot up off the ground in order to allow air circulation and the fire to draw air up through the drainage hole. Insert the smaller metal grill inside the plant pot. The size of the grill should be slightly larger than the bottom diameter of the inside of the plant pot so that the grill rests a wee bit above the bottom of the pot and not flush against the interior bottom. Place the larger metal grill just inside the top of the plant pot. The size of this grill should be such that the grill does not rest far down inside the pot, but toward the top most reaches yet just beneath the top edge or lip of the pot by a few inches. Cross section of pot with grills inserted. You can build an asado grill of various sizes from small to extra large depending on your needs. The size of terra cotta pot you select will determine the size of metal grills you will need and how much food you can BBQ at one time. Bring the two metal grills with you to the store where you will be buying the terra cotta pot so that you can fit them inside different sized pots to determine what size of pot to purchase. Be careful not to select a combination of metal grills and a pot in sizes that create too small an area for the charcoal. If the top grill is too low down inside the plant pot and thus too close to the charcoal you will be more apt to burn your food.